What's the expiration date for nostalgia? Is there a certain amount of time that has to pass before we start looking fondly back at the old, often inferior, games of our youth? It's undeniable that some games have aged gracefully and are still just as good today as they were at their initial launch, but that's far from a steadfast rule. Some games haven't aged well at all, only enjoyed by those who still retain fond memories of playing these titles as a child. Then there are other games that were never any good to begin with; games that time has been especially brutal to. 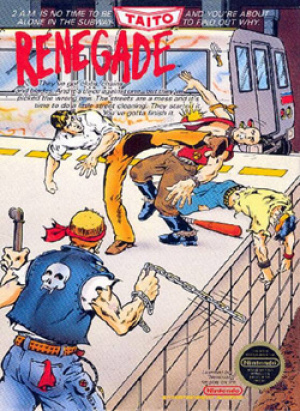 Technos’ NES beat-em-up Renegade always has been and always will be a complete wreck. 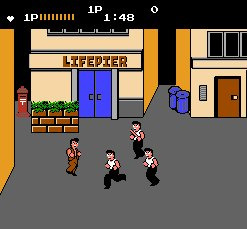 In this precursor to River City Ransom, you take control of Mr. K., a character who we learn very little about beyond his penchant for brown vests and matching slacks. Apparently Mr. K.’s girlfriend has been kidnapped, so he goes on a killing spree, wiping every man with a white shirt and black pants off the face of the earth in search of his lost love. The plot is generic, and as far as gameplay goes, you'll be spending most of your time mashing the attack buttons and wondering why you thought this would be any fun in the first place. Controlling a beat-em-up is usually pretty straightforward, utilizing the D-Pad for movement and the lettered buttons to punch, kick, or jump. Renegade manages to break this basic formula, opting instead for a control scheme that complicates things for absolutely no reason. The A and B buttons are used to attack, but rather than having assigned moves, they are instead based on the direction that Mr. K. is facing. Move to the left and B attacks forward while A attacks back. Change directions and your attack controls are completely reversed as well. It’s a bizarre design choice that takes some getting used to and never feels natural even when you’ve got the hang of it. As with any other Wii U VC game, the GamePad simply shows a replica of what is happening on your television screen as well as hosting a touch-sensitive menu. It’s true that Renegade functions properly and controls well enough, confusing attack interface aside, but that doesn’t necessarily mean that this game works. Combat is nothing more than button mashing with the hopes of landing a blow, but when you add the aggressive enemy AI into the mix it turns into a confused mess. There’s no way to block, and there isn’t an actual combo system that can be used to counter or cancel enemy attack, so the deepest your strategy can go is to punch and run. This makes the already repetitive gameplay even more tedious and completely unfair. It’s also worth mentioning that your enemies can cancel your attacks by returning one of their own, so if you get stuck between two and can’t squeeze your way out, you’re going to die. We hope you enjoy “Game Over” screens, because if you play this you’re going to be seeing a whole lot of them. Save states are a must for anyone hoping to complete this game as its terribly unfair AI makes it staggeringly difficult to play through without the assistance. 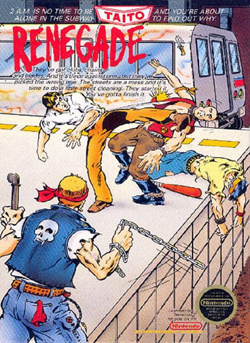 Like many games of its time, Renegade features pass-and-play multiplayer. Being able to actually play cooperatively would have possibly salvaged this one from being such a mess, but that’s not the case. There isn’t even a leaderboard built into the game, completely defeating the purpose of this type of multiplayer. The good news is that if your friends find out you’ve been playing Renegade, they probably won’t want to come over anyway. We’ve been told from a young age that if you don’t have anything nice to say then you shouldn’t say anything at all. Here’s our one nice thing: Renegade’s soundtrack is pretty good. It’s not an iconic mainstay, but it’s decently catchy in that minimal 8-bit kind of way. Please don’t purchase this game just for its soundtrack. Any fondness that one might have for Renegade is deeply rooted in nostalgia. It's true that many old NES games have not aged well, but this is one that was never any good to begin with. 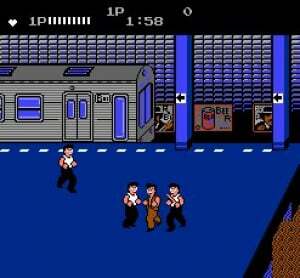 With other better beat-em-ups — such as Double Dragon and Final Fight — already available on the Wii U Virtual Console, it's next to impossible to give this one a recommendation. Rather than purchasing this game, why not have a pal kick you in the face for free instead? You'll receive just as much enjoyment and you can almost guarantee that, at least, the blow will land. Someone submitted an adaptation of this game to The Lost Worlds of Power. All I remember is frustration...and sadness. I tried to enjoy it, but between this and Mickey Mousecapade, I preferred Mickey Mousecapade. Oh Technos Japan, you disappoint me. 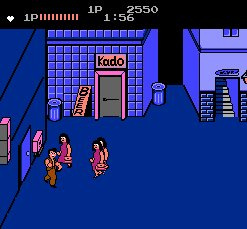 the review was a little harsh considering it was one of the 1st real beat em up and the grandfather all the great Kunio Kun games in Japan. Still it's nice to see that the EUR VC receives some games on Wii U which for some reason it didn't receive on the Wii. why are they pumping all the crap games out first for nes on wii u. @brucelebnd Renegade truly was a pioneer of the genre, but that doesn't save it from being a terrible game. Especially nowadays. 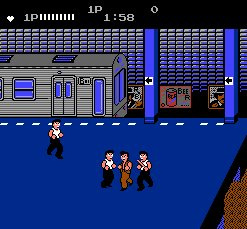 And also, this NES version actually never did anything for gaming as a whole, as it was the arcade original that defined beat em ups as we know them. So anything less harsh of a review wouldn't have been appropriate here. I'd even rate it just a 2/10. It's horrible and has NOTHING over its entire competition on VC. It's a shame, I absolutely loved Target:Renegade on my Spectrum. Guess nostalgia isn't what it used to be. Maybe I am going nuts but didn't you guys just review this game? @cmk8 It's not nostalgia playing tricks on you, it's that the Spectrum version was much better than this one, and Target was awesome.